QuizUp’s other stats are off the charts, too — the average QuizUp player, for example, plays the game for 40 minutes a day, which is one reason it recently got $1.2 million in venture funding. 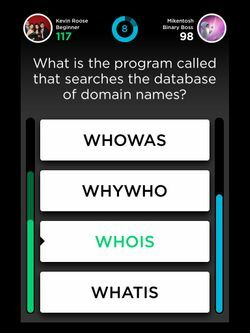 It’s all pretty impressive for a game that even its maker, Icelandic software company Plain Vanilla Games, admits is an absurdly basic idea: players competing against their friends and strangers around the world in trivia categories like Arrested Development and Fruits & Vegetables. But there’s a complex science behind the simple premise; if it were that easy to make a mobile app go viral, after all, everyone would do it. I spoke to Plain Vanilla CEO Thor Fridriksson about the secrets to creating a huge hit, the lessons he learned from other successful games, and how he almost went broke along the way. The first secret to making a hit game, Fridriksson told me over a Skype chat from his Iceland office, is latching onto an existing brand. He learned this the hard way: Plain Vanilla’s first game was an original game for preschool kids called The Moogies. It was a “beautiful title,” Fridriksson says, but it got steamrolled in the App Store by a Dora the Explorer game that was published around the same time. Fridriksson lost almost all his money on The Moogies. “It was just a total failure. No one was buying it,” he says. As their next act, Fridriksson and his colleagues spent days thinking about games that already existed in analog form, but hadn’t been ported to mobile in the right way. Scrabble was already taken (Words With Friends), as was Pictionary (Draw Something), but there was no dominant mobile version of Trivial Pursuit. And while Trivial Pursuit had an official app, it was basically just a digitized version of the physical board game. He thought he could do better. 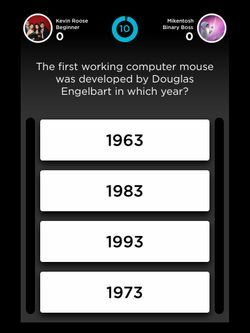 Part of QuizUp’s viral appeal is its simplicity. To begin playing, you register using Facebook, and right away, you’re given a list of categories to choose from. Once you choose, you’re given a series of multiple-choice questions, and the player who gets the most answers right wins. As you play more against other users, you gain XP, and you move up a leaderboard against both your Facebook friends and global, local, country-by-country, and state-by-state lists. The interface itself is perfectly intuitive for anyone who’s ever watched Who Wants to Be a Millionaire? or gone to a pub quiz night. When I tested it out, I went from downloading the app to playing my first game within a minute. My first game, in the tech category. Make it a little clubby. While QuizUp gives players the ability to purchase more XP to level up faster, in-app purchases aren’t the game’s main money-maker. Instead, Plain Vanilla has partnered with brands like the Twilight movie franchise to create sponsored games. Fridriksson calls this a “win-win,” since Twilight gets massive exposure to millions of players, and avid fans of the movie get to show off their obsessive knowledge. Fridriksson says that this strategy, and its huge money-making potential, is part of what’s made mega-game-makers like King and Zynga take note of QuizUp. Fridriksson admits that, as of now, some of the discussions on the app are “just noise.” But he says that within certain topics, like Physics, the company is actually seeing “really intellectual discussions.” “We’re making a micro social network,” he repeated. When you have a hit, stop doing everything else. Mobile-game-makers talk fearfully about the “Draw Something effect,” the name given to any app that experiences an insanely fast growth rate, then become passé once users have moved on to the next big app. Some studios, like Zynga (which bought Draw Something weeks before it fell off a cliff, making it maybe the worst-timed tech acquisition in history), deal with the threat of obsolescence by releasing sequels, or rushing lots of similar games onto the market to try to keep users’ attention. Fridriksson is aware that QuizUp’s popularity might not last. But he’s not taking the diversification approach. His 30-employee studio is now entirely focused on QuizUp, and all other projects have been abandoned. “We’ve evolved from being a game studio that has multiple titles into just being QuizUp,” he says. Though he’s hopeful that the game’s social-network element and ever-changing content will keep users flooding in, Fridriksson is aware of the possibility that QuizUp might eventually go the way of Draw Something. Still, he says he’s not looking to the next thing quite yet.